In general I stay away from reviewing Windows-based computers, basically because they get so much coverage on their own and also, to be honest, I’m a long-time Apple user. So when I was offered a chance to check out the new HP Spectre ONE (23-e010se) all-in-one desktop PC, I looked it up online before accepting. It’s hard to not compare it to an iMac, so I had to get ahold of one. There’s no need for me to go into what the Windows 8 operating software does in a computer like this; Microsoft does enough promoting on is own. What’s packed inside of this gem is a 3rd Generation Intel Core i5-3470T dual-core processor 2.9GHz along, a 1TB (5400 rpm) hard drive and my unit had 10GB of RAM for testing. Before I even plugged it in, I had to admire its 23.6-inch glass LED-backlit display (it’s not a touchscreen), which is slightly less than a half inch thick and is home to to the computer itself. Like its competitors, HP had to eliminate something to get it so thin so you’ll have to purchase an external optical drive to use or burn CD or DVD’s since there isn’t one built in. The entire system has just one wire, a power cable, which is plugged into the back of the display stand. After you connect the power, hit a button on the top right of the display to get it going. All the accessories are wireless and work with a USB dongle under the display in a live USB port. A pair of AA batteries go into the keyboard, mouse and trackpad for power. After that just hit the connect button on each device and from there it’s almost plug and play. 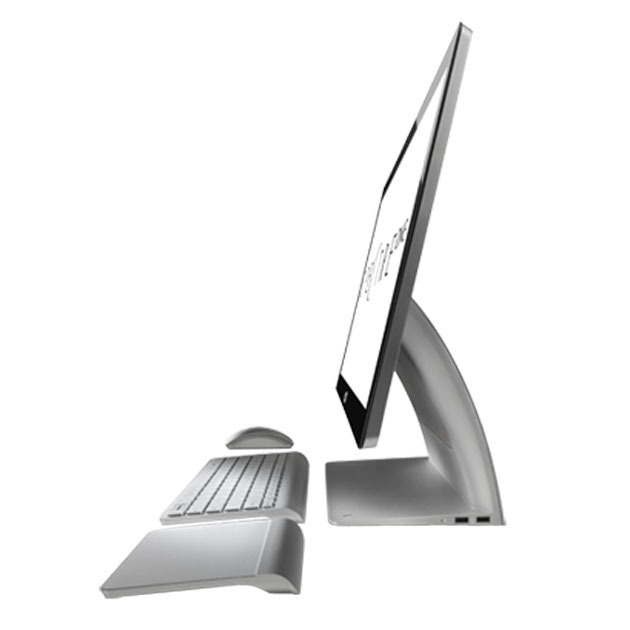 The operating system goes through a short startup and connect to your WiFi (802.11b/g/n) network or plug in a network cable to the back of the monitor. All of your connections are on the base of the monitor, which includes a pair of USB 2.0 ports, HDMI, power and a Kensington lock. A pair of USB 3.0 ports are on the right side of the base, while a SD card reader and headphone port are on the left side. You really can’t get a clearer display than the 1080p this produces and the sound, which is listed as Beats audio, sounds great. Even with the latest Window’s operating system, it still seems like a chore to do anything for a Mac user but after a few days on the Spectre One, it’s obvious HP has finally made a PC you would call fun. The Epson WorkForce WF-3540 is another in what seems like a never-ending line of all-in-one desktop printers for home or small businesses. Regardless of the brand, we all feel the same way about the cost of ink so you have to look at the features of a printer when choosing what to buy. 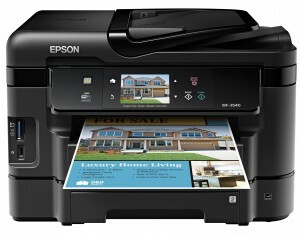 This one has everything, including Epson Connect, which allows you to print digital files (emails, photos, documents) from anywhere around the world. With the group of mobile apps, Apple devices and other computers, tablets or smartphones can be linked to print on the 3540. The printer is a little big and bulky (17.7 x 22.2 x 12.1-inches) so it will take up a little more space then the average ink jet printer. 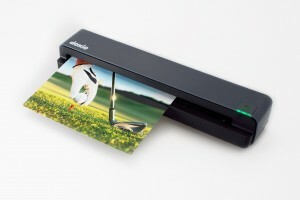 The all-in-one describes printing, copy, scan and fax. For most, printing is the key feature and it’s endless what you can do. Among the printing features is double sided printing, a 500-sheet paper capacity, a 3.5-inch touchscreen LCD and is rated for 1 sided 15 black pages per min and 9.3 for color. A four color DURABrite ink system is used (black, cyan, yellow and magenta) that comes in high-capacity sizes, that lets prints come out in dry and smudge free prints. Scanning (up to 2400 dpi) is simple with scans able to be saved as PDF’s that are text-searchable and can be saved to flash drives (not included) plugged into the USB port. Single pages can lie right on the scanner or use the 30-sheet auto document feeder. Other options for connecting is an ethernet port and built-in Wi-Fi for wireless printing and even emailing. Even with all these wireless functions, it call still be connected directly to most any WIndows or Mac operating system. Faxing: that’s so yesterday, but the 3450 will take care of it if need. With the portable electronic world growing at a rapid rates, I could write every week about portable power options to keep your devices running and this week’s entry is the pocket-sized FatCat mPower Travel Charger Series. 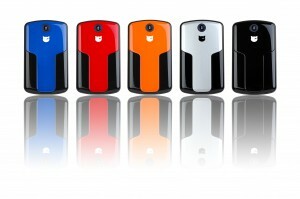 The chargers come in a variety of colors but most important are the size choices of 2,000, 4,200 or 9,600 mAH. All you need to understand with those numbers is bigger is better. They give you the option to charge most any portable USB-powered device at least twice or with the biggest model can do a mobile phone up to about eight times. Power hungry tablets such as the iPad will need the bigger 9,600 for the 2.1 amp charge they require. The Doxie One portable scanner is computer-less and one of the easiest to work I’ve ever seen. Operating this scanner is as simple as a push of a button to scan photos, documents, receipts or just about anything you can feed it in sizes ranging from business cards to 8.5 x 15-inches. The scanner is portable to a point (1.7 by 10.5 by 2.2, 13.6 oz) where you can put it in your computer bag, but don’t stick it in your back pocket. There isn’t much to this scanner, except great results. You have several choices to power it up; the included AC wall power adapter or buy four AAA Ni-Mh rechargeable batteries. Just insert the included 2GB SD memory card, where your scans will be stored. Third party companies such as Eye-Fi make wireless SD cards, which can be used to wirelessly send your scans to a Mac, PC or even some tablets and smartphones. To retrieve your scans from the scanner you can insert the memory card in your computer or just connect the included USB cord to your device. Output formats include JPEG, PDF and PNG files in both color and black and white. A calibration sheet and a protect cover are included to insert your photos into the scanner, which is great to help protect them. Scanning 4 x 6-inch images takes just 5 seconds each with a 300 DPI color resolution or about 8 seconds for a full document scan also at 300 DPI color. Doxie software (Windows and Mac) acts like an inbox and so scans can be sent directly to other apps on your computer or to selected online cloud services. The purpose of a scanner like this is it’s portability and ease of use, the results are great quality for email, web use or smaller prints. I would call this scanner a great device for archiving that shoebox full of prints many of us have but don’t seem to have the time to deal with. The Doxie one can easily conquer that shoebox in an afternoon. While trolling around the Ableplanet display at CES, I had a quick conversation with someone, who was obviously a big fan of the product since he stated that his headphones from the company are the best he ever owned. While I can’t agree or disagree with his statement, I can say every set of headphones I’ve tested from the company has been nothing short of outstanding. includes the latest I’ve gotten my hands on from Ableplanet, the Musicians Choice stereo headphones. One thing I like is how the padded over-the-ear cups are flexible and turn sideways for space saving. 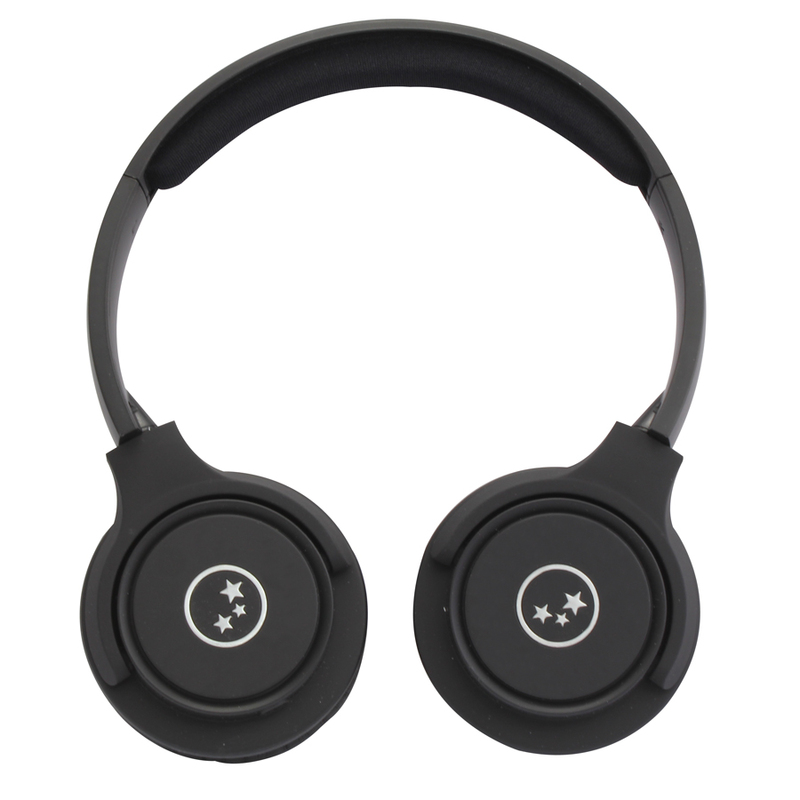 As for the sound, which includes the company’s Linx Audio sound, when you consider the price ($89 at Ableplanet.com or $44 at Amazon) you’re getting a great deal. As described on their site, Linx Audio creates high frequency harmonics that enhance sound quality and speech clarity of difficult to hear words or notes, and increase the perception of loudness without increasing volume. An in-line mic controls your sound and music selections on Apple portable devices along with other smartphones and tablets. They are available in 11 different colors and come with a soft carrying pouch. On a quick trip last week I tested out the OGIO Renegade RSS backpack, which has more storage compartments than even someone like me needed to fill up with a laptop, tablet, cables, accessories and gadgets. Each pocket is easy to access and seems to lead to more compartments, are zippered shut, padded and protected. 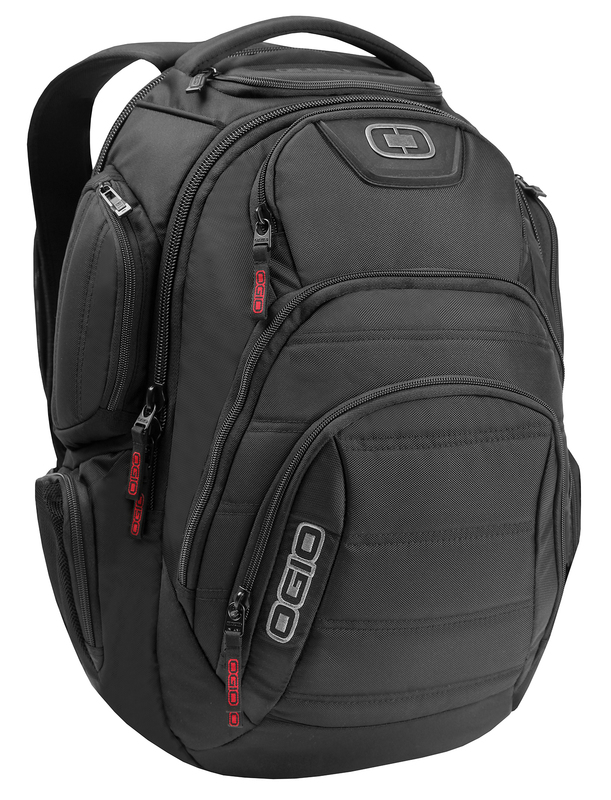 A unique design from OGIO called Red Protection (obviously red in color) identifies the safest storage compartment. In this case it was the back of the backpack, which I used for my 15-inch MacBook Pro, although a 17-inch would also fit. That compartment is also built with a Reactive Suspension System, which translates into a safe and padded storage area. Pockets, zippers and padding seems to be everywhere and it has padding on the backside so it rests comfortably on your back. Another specific feature includes a crush-proof Tech Vault, which I used for storage but opted to not test the crushing part; I’ll just take their word for it. There’s also a tablet pocket but you’ll have your choice of many different places to store that device. I’ve seen a lot of computer bags and storage solutions and this one is as well constructed and designed as any I’ve seen. Although it costs more then others, when you factor in how much you spend on the products you store in any computer bag, it makes sense to store them in something that’s going to protect them, such as the Renegade. The MacWorld Expo trade show (last week in San Francisco) isn’t what it used to be, but if you’re an Apple junkie it still has a lot of appeal. It’s pretty much all Apple, with a little PC thrown in here and there. The show featured an endless number of innovative features your Mac or iOS device, even cooking, cleaning and singing. A company named Daiya has nothing to do with the electronics world, but since I spent more time there then any other display, I thought it’s worth mentioning. 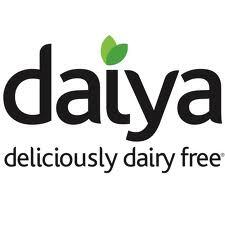 A company representative said they were displaying their dairy-free cheese-alternative products at the show because they want to share the product with people who like innovative products. The company’s slogan is “deliciously dairy free” and after sampling more than my share of pizza and grilled cheese sandwiches, I was certain that if you didn’t know what the product was, you’d think it was made with 100 percent natural cheese. The ingredients are all plant-based, making it vegetarian, lactose intolerance, kosher and cholesterol friendly. 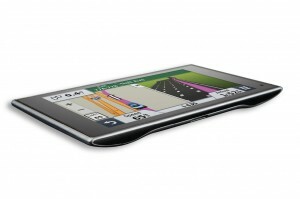 The super thin Garmin Nuvi 3597 does everything needed to get you where you need to be with directions that now include specific points of interest such as recognizable landmarks, stop signs and traffic lights. It’s built with an incredibly thin body of a half-inch thick, and has a five-inch diagonal touchscreen LCD. Features include a a new powered magnetic mount, which has a pass-through charging. It directs you in friendly tones, telling (and showing) you what lane to be be in, landmarks to look for before turning and when a street light is approaching. Right out of the box, it’s loaded with detailed maps of North American and includes free lifetime updates. 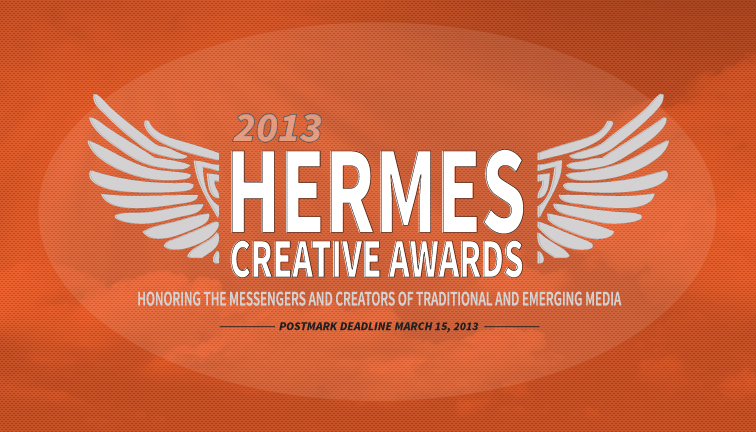 Today marks the opening of the 2013 Hermes Creative Awards competition. The deadline is March 15th! Don’t delay, enter today! AVA Digital Awards set to announce Winner’s of the 2013 competition. Vist www.avaawards.com after 5 PM CST today! 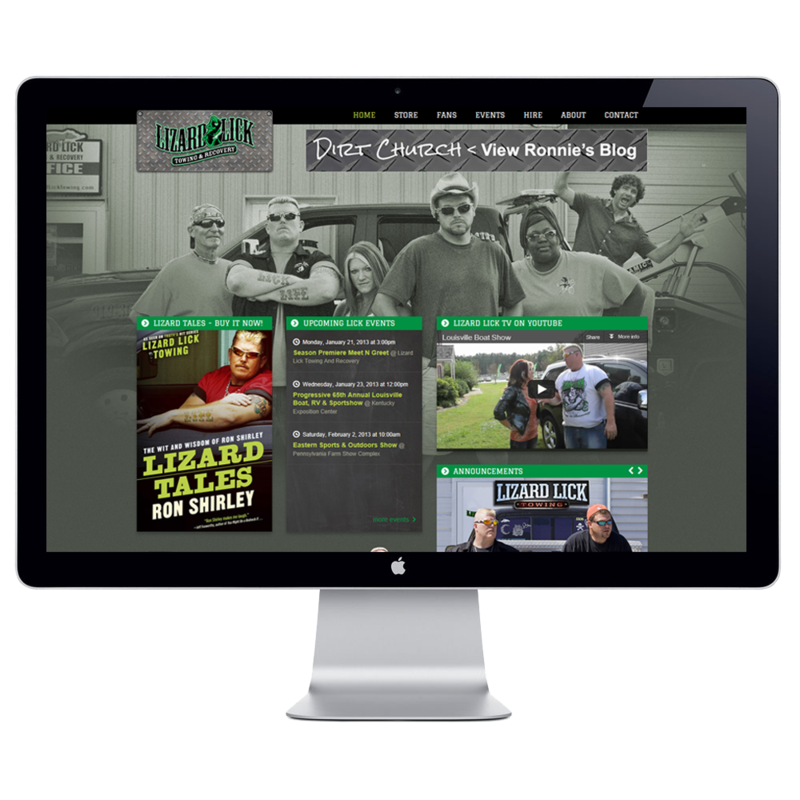 UPDATE: 2013 Winners posted here! Kensington’s Proximo Fob and Tag Kit creates a wireless (Bluetooth) monitoring system between your keys, accessories and an iPhone (4S or 5) that will alert you if they are separated. I tried the starter kit ($59.99), which includes a Fob, Tag, keyring and has a screen driver to open the hardware and insert the included CR2032 lithium coin batteries, along with a keyring. It’s easy to think of this as a monitoring device for your expensive smartphone but it also works in reverse once everything is linked up. 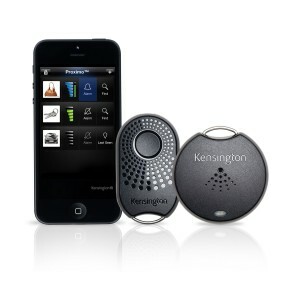 With your phone in your pocket or purse, it can alert you that you have left your keys behind. Within the app, you can set the sensitivity and a specific sound to allow you to control how far you are separated from your device before the alarm goes off. The Tags look like the Fob and can be placed in a computer bag or attached to anything (or anyone) that you want alarmed. But unlike the Fob, it’s only one direction; the app will find it but you can’t use it to find your phone. The Proximo App Dashboard tracks up to five items with a single Fob and up to four Tags. Additional Tags cost $24.99 each. A battery meter on the dashboard will alert you of a low battery needing replacement in any of the devices, which should be about every six months. If somehow you get out of range between the devices, an app lets you tap a button to let you know where your device was last seen and even pulls up a map with a specific address. 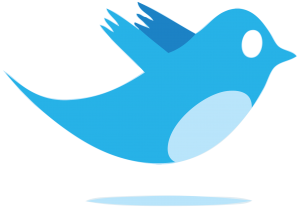 Even if your phone is on a silent mode, when the alarm is activated, you’ll hear it. RadioShack’s Auvio expanding Bluetooth speaker ($39.99) is as simple as a gadget can be but it’s one of those things you won’t stop using. Just twist open the speaker, pair it with your device via Bluetooth and you’ll be amazed at how much better the sound is than the built-in speaker on your smartphone or tablet. It’s not room-filling sound, but great for an office or, especially in my case, having some sound to play satellite radio while stuck in hotel rooms. A rechargeable battery is built in for up to eight hours of use and can be powered up in two hours with a USB charge using the included cable. It is 2.5 inches in diameter, just over 3-inches long when expanded and about 2.5-inches when closed. 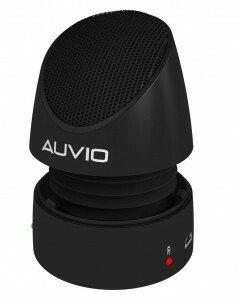 Another choice, with a bigger size (2.8 x 6.5 x 2.9-inches) but much better sound is the the brick shaped Auvio Portable Speaker ($79.99). It’s also Bluetooth and works as a hands-free speakerphone and runs on a built-in rechargeable battery. Both speakers have aux-in ports to connect to non-Bluetooth devices. 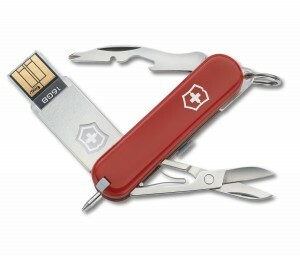 The Victorinox Swiss Army Jetsetter looks like a tradition pocket knife the company is famous for but instead of the knife you get a pocket full of storage. A foldout and detachable USB 2.0 flash drive is among the features in the mini tool kit, which includes a ball point pen, bottle opener, phillips screwdriver, tweezers and scissors in the 16 GB model I tested out. The detachable flash drive is Windows and Mac friendly, although it comes pre-loaded with Mac-friendly security software to protect your data stored on the device. This lets you secure your data with passwords and even web brows without leaving any cookies or history behind. It’s available in capacities of 8 GB black ($39.95), 16 GB red ($49.99) and 32 GB silver ($99.99). There are a few different features in each, with the 32 GB model having a LED mini light for example. The Logitech Harmony Touch remote does everything you want your pile of existing remotes to do and a whole lot more. It costs a little more than what you might want to spend for a universal remote but after seeing how easily it can be programed with your computer to operate more than 225,000 devices _ up to 15 of them at once _ money won’t be an issue. What I have found out about Harmony remotes is how easy it is to program them for your specific choices of channels; then just navigate the 2.4-inch touchscreen with backlit buttons to select your favorite choices. The company obviously spent a lot of time and effort on the design of the remote, so it’s worth mentioning that the curved design rests comfortably in your hand while in use. At first, the number of buttons might be a little overwhelming, but get past that and give it a try. Using the Logitech MyHarmony website lets your configure the remote to set up your devices (TV, DVR, DVD, receiver, etc) and choose your favorite channels and shows. My initial setup didn’t work the way I wanted to, (I had a picture on my TV but no sound) so I went back to the website and reprogrammed it to my preferred choice and it worked perfectly. 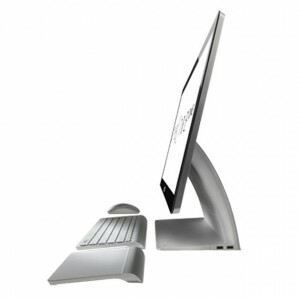 In addition to the touchscreen LCD, other choices include pause, play or stopping your program. A drop-in charging cradle is included to keep the lithium-ion battery charged up. Computer accessory maker Targus and iDevices LLC have a technology partnership for the design, development and distribution of the iNotebook. 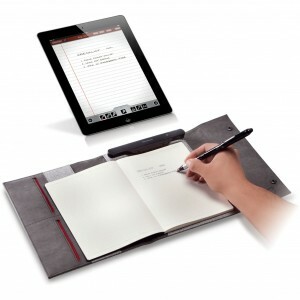 The new device, gives iPad users the option to write or draw on paper and transfer it to the table wirelessly. The hardware includes the Bluetooth-enabled writing receiver that communicates with the included stylus/pen to transfer the handwriting. Both are built with an internal rechargeable battery and are charged with the included miniUSB cable. A leather portfolio is included to house the iPad and notepad (compatible with standard A5 and 8” x 5” notepads), which isn’t made of any special paper so it should be easy to find replacements. Setup is simple, requiring download and installation of the free iNotebook app from the Apple App Store. The app puts all the pieces together from the pen, to the paper, receiver and finally to the tablet. There’s not a lot to it; get all the pieces turned on and write away. Documents can be saved in the Apple iCloud. Other features can be customized, such as how to organize the saved files, what the backgrounds look like and you can even email directly from the app. 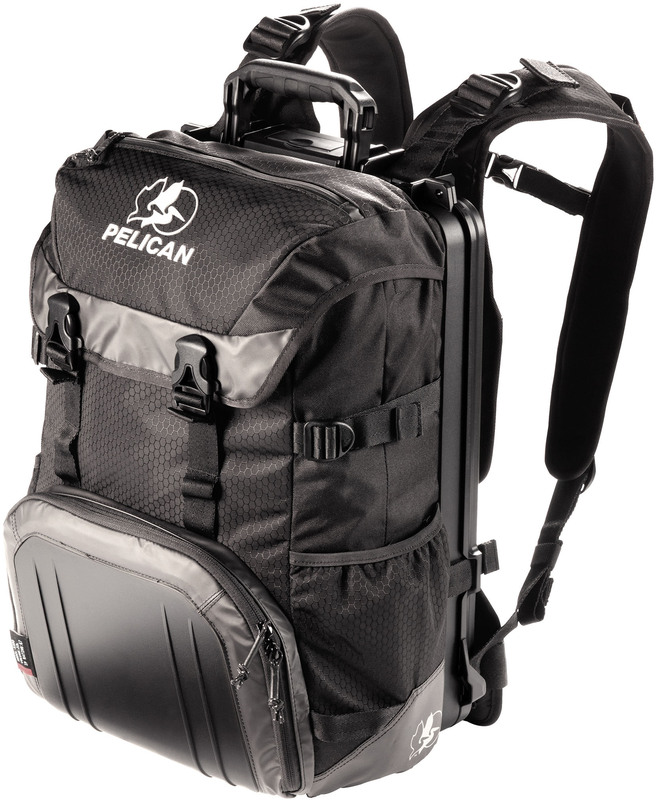 When you read the list of features in the Pelican ProGear S100 Sport Elite laptop backpack, you would think you’re reading the specs of a backpack ready for combat. From a distance it looks like any other backpack but when you get up close you see the craftsmanship that a company like Pelican has become known for. Among the features are a built-in crushproof and waterproof case, lockable compartments, a TSA-ready laptop area, hip belt, shoulder straps and a lumbar pad with an ergonomic ventilated back. All of these are encased in a rip-resistant material. It weighs 7.14 lbs empty and is carry-on friendly when traveling by air. The TSA aspect keeps your laptop (up to 17-inch) in a separate compartment so it can be inspected by airport security without obstruction. A front compartments can hold endless number of computer and electronic accessories or even a change of clothes. Once filled (as long as your back can take the weight) it’s amazing how much it holds and how well it functions. Cleaning out a notebook from last weeks Consumer Electronic’s show is an impossible and endless task, but here are a few items I either used all week to get me through the show or caught my attention as cool everyday items. The Innergie PocketCell Duo, did an amazing job at keeping my iPhone and iPad powered up all week while I was away from wall outlet charging. It’s a pocket sized charger, measuring just 3.75 x1.75 and 1-inch deep – 40 percent smaller than a typical eye glass case – so it’s easy to carry in any pocket. The device is a rechargeable battery with 6,800 mAh of power and pair of USB ports in the side, which attach’s to most any portable electronic gadget for charging. This includes the power-hungry tablets, which require 2.1 Amp USB ports for charging. Five LED power level indicators along with a power/charge activation button are are also built into the side of the battery. Included is the Innergie Magic Cable Trio, which has an integrated 3-in-1 Apple 30-pin, Micro and Mini USB connectors in a single cable. The battery also works with the USB cable, which comes with virtually every gadget. 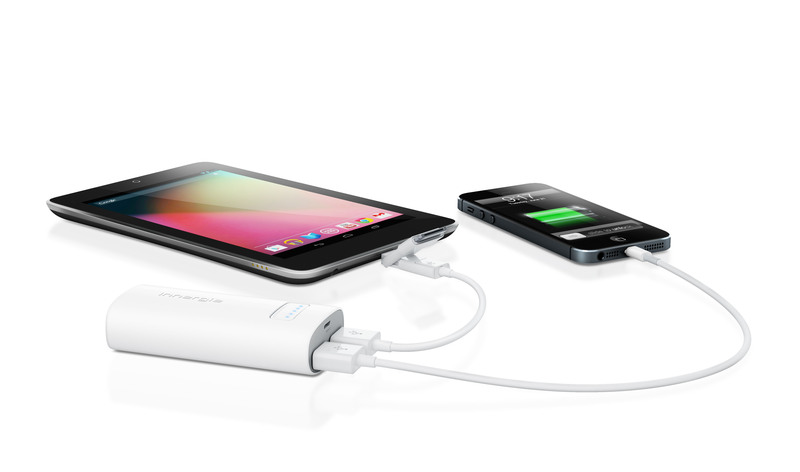 The powerful 6,800 mAh are good for charging a smartphone four times or giving a tablet a full single charge. www.myinnergie.com $99.99 available in March, the Innergie Lightning Tip will be available in early April. Goal Zero, the world’s largest manufacturer of portable solar products, launched the Goal Zero Yeti 150 Solar Generator. It weighs 12 pounds, measures 7.75 x 5.75 x 6.75-inches and has a 150-watt battery for powering lights, laptops via the built-in AC, 12V and USB ports. 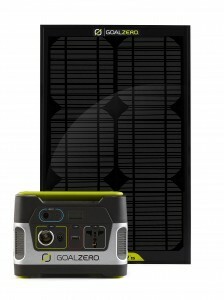 The 15W Bolder 15 Solar Panel can fully charge it up in 15 hours of sunlight.